Hangloose Baby is a multifunctional baby blanket. Namely a playpen mat, play mat and hammock in one. This soft and sturdy designer rug consists of different layers and materials. The top layer is made of natural cotton with a soft airy filling. The unique stitching lines of the top layer are inspired by the Japanese origami paper folding art. The carpet can be folded in different ways. By folding you can create a litter for your baby. The undergarment is attached to the outer garment and can be used for the hammock function. The baby lies wonderfully on the soft top layer and thanks to the firm underlay safely with a straight lying position in the folded nest. In addition to the hammock function, you can also use hangloose as a play mat or play mat. Hangloose Baby is also suitable for use outside the door. In the park, on the beach or just in the garden. A baby hammock is advised by maternity care and the consultation center for babies with overstretched tendencies, crying babies, babies with a preferred posture or babies with problems in motor skills. Healthy babies can sag too far in a normal baby hammock, which is not good for the spine. The baby can also lie with the head against the cloth, with the result that breathing can be impeded. 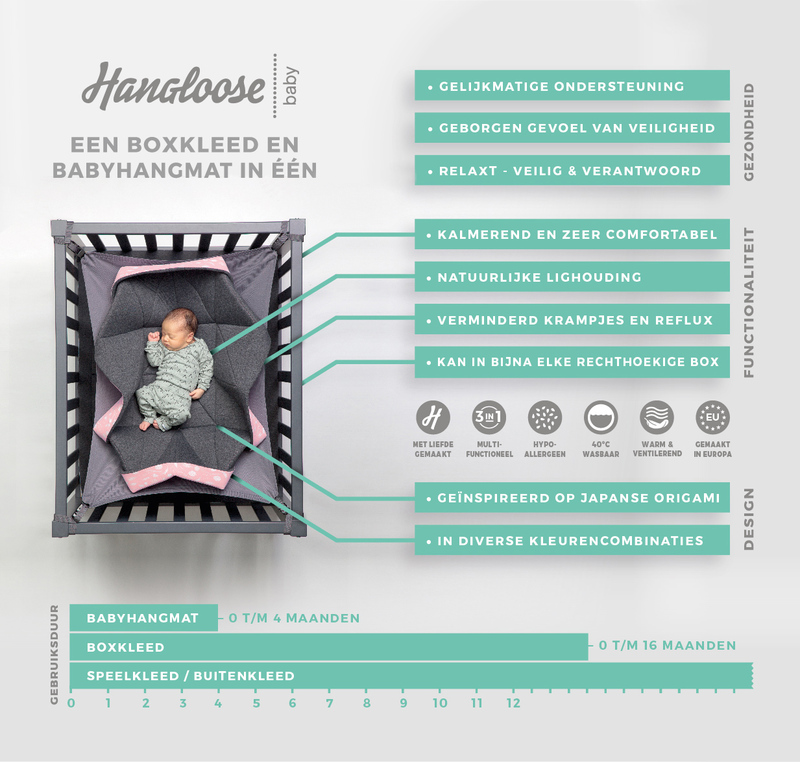 Hangloose Baby has a reinforcement in the lying area so that the back is supported well and evenly. In addition, Hangloose Baby is adjustable and you can decide how right your baby will lie. Also for the back of the parents or caretakers the elevated position of the baby is a blessing. The Hangloose Baby rug meets all safety requirements. The hammock function can be used until the baby can turn and raise independently. By means of the folding function you create a litter for extra safety and a sense of security. We are aware that the design plays an important role, because a baby box and a playpen will often be present in the living room for a long time. That is why we have also given a lot of attention to a distinctive design. The top layer of the Hangloose Baby always has a special uni-color; the other side has a fresh color with an illustrative pattern. The limited visibility of the illustrative design makes the appearance of the design subtle, playful and stylish. The Hangloose Baby playpen mat measures 80 x 100 cm. The hammock function can already be used for boxes with an inside dimension of 72 x 86 cm. 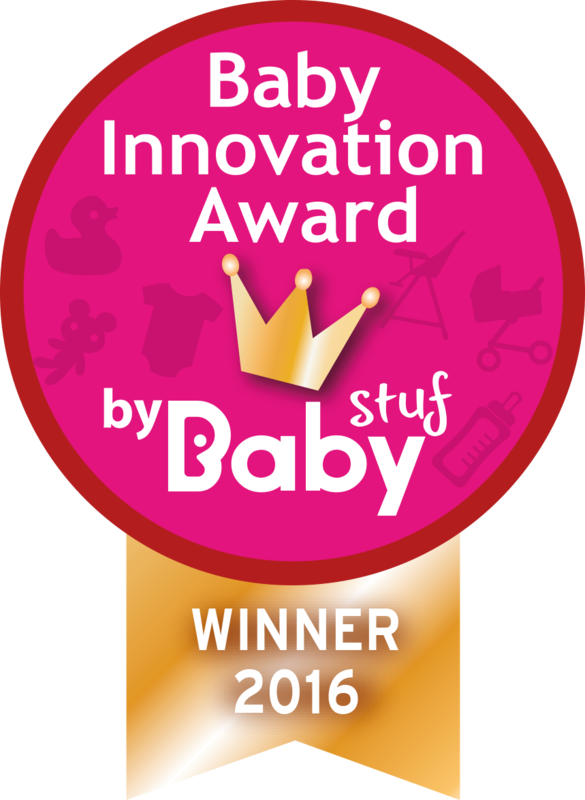 Winner "Baby innovation award 2016"
Hangloose Baby is the winner of the "Baby innovation award 2016" in the category '' furniture and decoration ''. The announcement of the winner was on the nine-month exhibition in February 2016. The Baby Innovation Award is an initiative of trade journal Babywereld and consumer platform Babystuf.nl, in collaboration with the Nine Months Fair and fabulous mama & family. In November, the jury of experts and editors nominated the most innovative baby products. The results of the professional jury, online voters and visitors of the 'fabulous mama & family' Juryday together determined the winners of this prestigious prize in the baby branch.